I know it’s Springtime when asparagus is abundant in the grocery store and at a great price, I might add. I adore asparagus so much! It’s easy, versatile and so very good for you. Did you know that asparagus is good if you are trying to lose weight? It has lots of fiber, so it keeps you feeling full longer because it takes your body longer to digest the fiber. Did you know that asparagus is a natural diuretic? Eating more asparagus can help you flush out excess water and salt. Asparagus is full of antioxidants and Vitamins E & K.
Here’s a great article detailing the benefits from eating more asparagus. Anyway…..this great side dish is one of my faves. I make it all the time because it’s pretty much good with everything! I love the garlic-y, spicy and lemony flavor. It pairs well with so many things…so it’s a quick go-to vegetable for me. A wonderful side dish that will be the star of the meal! Line a sheet pan with parchment paper or foil. Trim the woody stems from the asparagus and place evenly on the sheet pan. Drizzle with olive oil, red pepper flakes, garlic and salt & pepper. 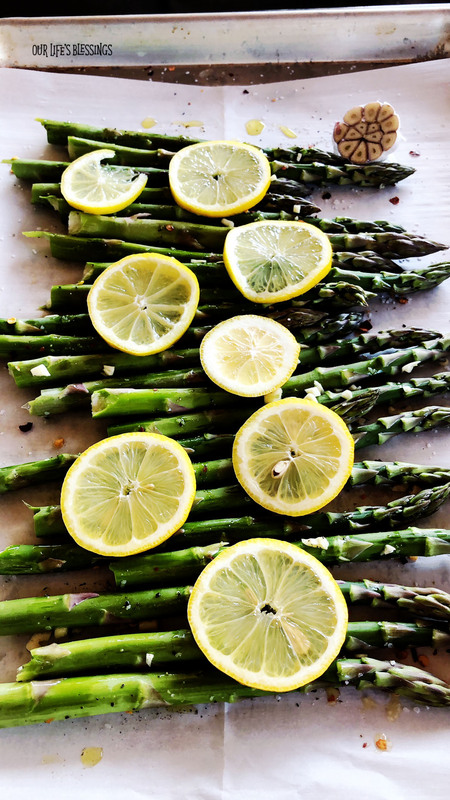 Place lemon slices all over the top of the asparagus mixture and place in the oven. Roast in a 400 degree oven for 10 to 12 minutes. Doesn’t it look so Springy? Just makes me happy looking at it! Next Next post: One Skillet Breakfast Hash.